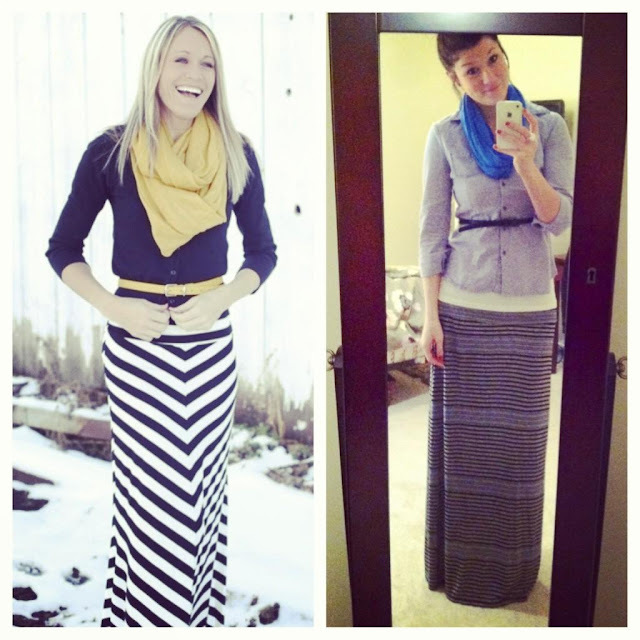 love, elizabethany: guest pinspiration: emily's maxi skirt outfit is perfectly comfy! guest pinspiration: emily's maxi skirt outfit is perfectly comfy! This morning started off beautifully... with a picture Emily sent me of her Pinspired outfit! I've seen this chevron maxi skirt pinned several times, but Emily decided to copy it and make it her own! Just the original skirt: $50! Emily's Pinspired outfit: About $35! She said she got everything from TJ Maxx, including her striped skirt for $10! I see so many maxi skirt outfits that make me want to run out to the store and buy one, but I have no idea when I'd have a reason to wear one. It's not like we dress up to do this radio thing, but it was perfect for Emily to teach in today! @luvelizabethany this outfit together in 10 minutes. Haha! Now I want to find more outfits like this...so comfy! That outfit is just plain fantastic. A great combo of comfy, cute, dressy, and casual. Yay for Pinspiration! PS: If you ever wanna be featured with your Pinspiration, email, tweet, or Facebook me!